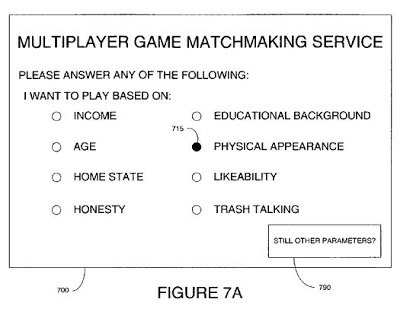 The ‘955 patent describes a method for accumulating data in order to successively match users during online gaming. One way players are matched together is based upon their style of play. The system attempts to match players who are looking for similar game styles, have similar skill levels, and have similar reputations. The invention uses measurements for several different characteristics before it matches up players, including: aggressiveness, playing likeability, and trash talking. After analyzing the several factors, the system matches players based upon its determination of whether the first player is a good match for the second player. A method and system for accumulating data to match and matching a user, based upon a play style and/or personal attribute, in an online gaming environment is described. One aspect of the invention provides a matchmaking system that matches players based upon a play style of the players. The system matches players who are looking for games with players who prefer similar play styles. Similarly the system can match players based upon a personal attribute of the player. The system can be built into existing general skill level and technical capabilities based matchmaking systems to provide more user desired matchmaking parameters, allowing a user to choose based upon play style, personal attribute, general skill level, and/or technical capabilities. 1. A method for matching users over a network in an online gaming environment, the method comprising steps of: entering a user into a first online game available over the network; receiving from the user by way of the network at least one response to at least one query to the user about the first online game experience following completion of the first online game by the user; determining a play style parameter of a requesting user based on the at least one response, the determined play style parameter for being employed to connect the requesting user to a second online game available over the network, the second game being different from the first online game; and connecting the requesting user to the second online game based at least in part on the determined play style parameter; the connecting being based at least in part on a collaborative filtering method that aids the requesting user in the selection of the second online game based upon evaluations of the second online game made by other users.